Secure Access to Your Personal Health Records. Now make it easier than ever to manage your family’s Patient Portal Accounts by linking all accounts together. 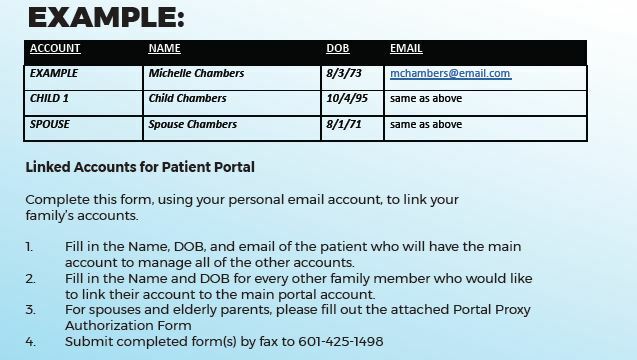 Complete the form (CLICK HERE) to link your Patient Portal Accounts for all Family Members. Please use a personal email account – no work email accounts. 1. Fill in the Name, DOB, and email of the patient who will have the main account to manage all of the other accounts. 2. Fill in the Name and DOB for every other family member who would like to link their account to the main portal account. 3. For spouses and elderly parents, please fill out the Portal Proxy Authorization Form (CLICK HERE). 4. Submit completed form(s) by fax to 601-425-1498. For questions or for more information, please contact Michelle Chambers at mchambers@scrmc.com.